California natives were the only people I would think about if I thought about missions. But also soldiers and missionaries lived their. Missionaries job was easy. All they did was teach religion, language, and prayer. Soldiers did all the beating and watching my mission incase of a C.A indian attacks. California Natives jobs were that they could make leather products, wine, olive oil, and harvested crops. On these crops they made fruit, vegtables, and ingredients for soap and candles.They used their region resources very well for growing wheat, barley, corn and vegtables. They planted orchards of peaches, walnuts, figs, red and green grapes,oranges,pears,olives, and date palms. Natural resources were good for their sunny place and plentiful water. 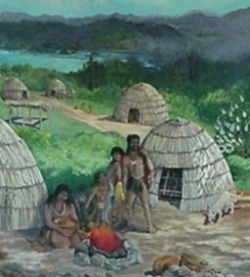 If you were interseted the Acagchemem Indians lived at my mission. To tell you the truth they didn't adapt very well either. Once they had converted to christianty they couldn't turn back and if they even tried the soldiers would find them beat them or punish them. What a life.